Even before she was born, Elianna Constantino had already cheated death. Elianna is the first in a pioneering clinical trial that pushes the boundaries of stem cell transplants. Led by Dr. Tippi MacKenzie, a pediatrician and fetal surgeon at the UCSF Benioff Children’s Hospital in San Francisco, the audacious trial asks: what if we could cure people of inherited diseases before they were born? MacKenzie’s trial isn’t completely new. Since the 1990s, doctors have wondered if it’s possible to perform a stem cell transplant on a fetus before birth. Many inherited blood diseases could potentially be cured this way: alpha thalassemia, beta thalassemia (the more common variant), or the big one—sickle cell disease, in which red blood cells grow into sharp sickle-like shapes that damage blood vessels and prevent effective oxygen delivery. Obviously the treatment is extremely dangerous for a newborn. Because of high fatality rates, many expecting parents are given the option to terminate the pregnancy if a child has an inherited blood-based disorder like alpha thalassemia. But the animal studies also offered a glimmer of hope: fetuses are the perfect candidates for a stem cell transplant. And their mothers, if healthy, are the perfect donors. Elianna’s parents knew something was wrong with their child at 18 weeks. An ultrasound found an enlarged heart—twice the normal size—and fluid building in the lungs and other organs. Her brain seemed to lack oxygen, even though blood was rushing through the organ abnormally rapidly. All signs pointed to alpha thalassemia major. Treatment options were limited. Elianna could receive blood transfusions to replace her malformed red blood cells, which carry oxygen across the body. If born alive, she would need these blood replacements for life. And even then the risk for significant brain damage would be high. But there was a silver lining: Elianna’s mother had a healthy copy of the genes contributing to alpha thalassemia major. The disease involves two main genes, each with two copies. In order for symptoms to show, all four copies need to be bad. Because the mom had healthy copies, her stem cells were also healthy, which in theory could produce functional red blood cells for her fetus. The team took a sample of bone marrow from Elianna’s mother and isolated blood stem cells. These cells have the potential of becoming any type of blood cells. Roughly 50 million of these healthy cells were then injected through the mom’s abdomen into the umbilical vein during a blood transfusion. Once released, the cells could circulate with the blood and develop into healthy, mature blood cells. It’s an enormous number, but for good reason. Stem cells home in to the bone marrow like little torpedoes. The larger the number of transplanted cells, the higher the chance that the mother’s healthy stem cells could elbow out the fetus’s defective ones. After three more blood transfusions in the next few months, Elianna was born against all odds. MacKenzie is thrilled. “This is the first case in which we’re using a high dose of the mother’s cells placed directly into the fetus’ bloodstream,” she explained, adding that doing all three things may lead to a higher chance of success. For now, the team doesn’t know if Elianna is completely cured. So far in her young life she still needs a blood transfusion every three weeks, but the team has found her mother’s stem cells in her bloodstream. The next step is to see whether the mom’s cells permanently nested inside her child’s bone marrow—called “engrafting”—and if those cells can generate healthy blood cells throughout the child’s life. But this phase one trial is already a success in that neither the mom nor Elianna seemed to experience any negative side effects such as immunorejection. “I’m thrilled that it was safe and it was feasible,” MacKenzie said. The team plans to continue optimizing the treatment protocol to potentially increase the chance of a successful stem cell engraft. MacKenzie’s trial is just one illustration of how fast fetal medicine—once thought to be impossible—is progressing. Earlier this year, a team successfully prevented three children with a rare genetic disorder from being born without sweat glands. In that case, the fetuses were injected with a protein that their bodies couldn’t make themselves—although the protein drug didn’t work in babies, it allowed the fetuses to develop sweat glands, which are crucial for maintaining body temperature. 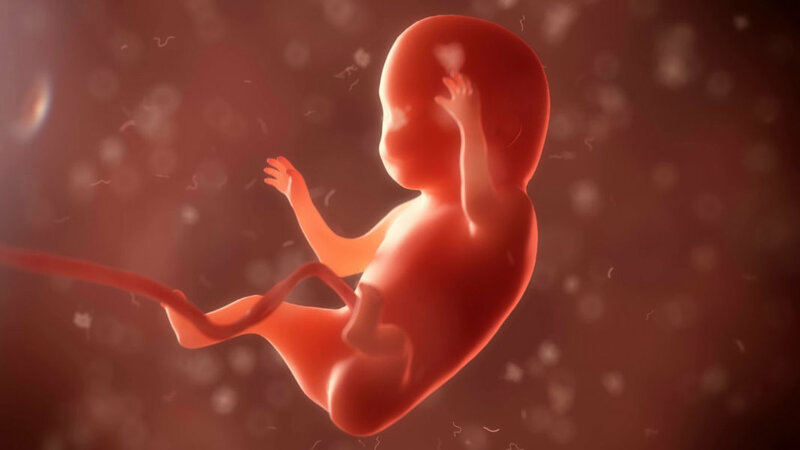 The results show that it may be possible to catch certain genetic disorders early—well before birth, when the fetus is undergoing rapid developmental changes. If doctors can target malfunctioning genes or cells at a critical time point before they wreak havoc in a newborn, then it may be possible to treat a previously incurable disease—before a baby is born.